When highly fermentable carbohydrates (eg grains) are fed to stock the production of total rumen organic acids increases and pH decreases increasing the risk of digestive disorders (eg acidosis). 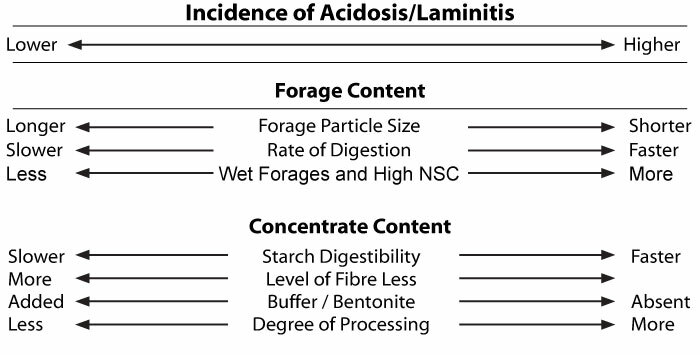 Acidosis classically occurs when stock are suddenly changed from high roughage diets (eg 100 per cent pasture) to high concentrate–low roughage diets (eg 65 per cent grain and 35 per cent roughage). Changes to the level, type and composition of the grain ration is also a common cause of acidosis. With stock that are unaccustomed to grain diets, even low levels of supplements can cause problems. The common symptoms of acidosis include reduced chewing, erratic appetite, decline in feed intake, diarrhoea, swollen feet and hocks and lameness (laminitis). This article outlines the primary nutritional factors that cause acidosis and laminitis and the importance of good feed management. Acidosis is a pathological condition associated with the accumulation of ruminal acids or the depletion of alkaline reserves in blood and body tissues. Ruminal acidosis develops in cattle that have digested relatively large amounts of unaccustomed feeds rich in highly soluble carbohydrates. 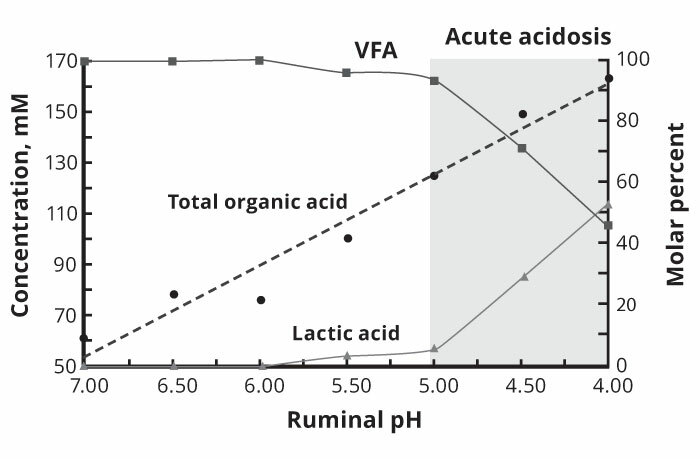 "Acidosis increases morbidity and markedly reduces production"
The production of large quantities of ruminal organic acids (volatile fatty acids – VFA's) decreases rumen pH, simultaneously weakens the buffering capacity of the rumen and reduces the intake, digestion and fermentation of roughages. Acidosis can be divided into two categories, acute and subacute depending on the metabolic insult (Table 1). 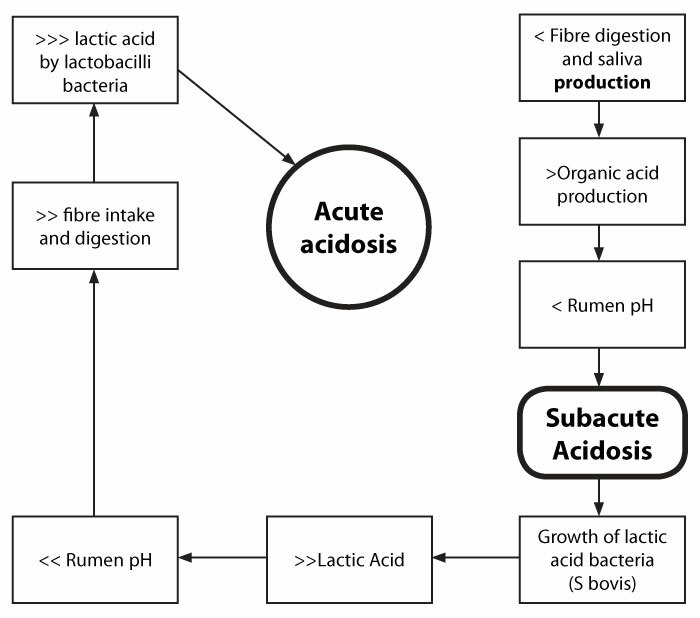 Subacute acidosis is caused by an increase in the total level of organic acids whilst acute acidosis is caused by an increase in specific organic acids (eg lactic acid) (Appendix). Clinical signs and problems associated with subacute and acute acidosis are outlined in Table 1. Dietary and feed management factors can have a significant impact on the pattern of feed intake and the incidence of acidosis. May involve a number of stock in a group and can have production and economic implications. If not corrected and stock are continually challenged, stock develop secondary problems and/or acute acidosis. Reduced feed intake, reduced appetite, diarrhoea and depression. Increased nasal discharge and coughing. Lameness due to swollen hocks and feet. If unrecognised can cause long term secondary issues eg foot disorders, lameness and liver abscesses. Generally involves a small number of stock within a group of stock that are affected by subacute acidosis. Production and economic implication depends on the severity and number of stock involved with limited success to treatment. Scouring, diarrhoea, toxaemia and "downer" syndrome. Paracute cases may result in coma and death in 8-12 hrs. Symptoms develop within 8 hrs and the onset of metabolic clinical acidosis peaks around 36 hrs. If the blood pH drops too low this can result in death. Hypocalcaemia resulting from calcium malabsorption, laminitis from the release of histamines and endotoxins in the blood, rumenitis and liver abscesses. Note: Both acute and subacute acidosis cause laminitis and lameness however, foot disorders (eg laminitic rings, extended toes and abnormal horn formation) may not be observed until 4-8 weeks after the metabolic insult. If unrecognised can cause long term secondary issues eg foot disorders, lameness and liver abscesses. The amount of ruminal acidity is measured by pH readings. In high roughage diets (eg tropical pasture based systems) the pH level is relatively stable between 6.2-7.0. "Below pH 6.0 fibre intake and digestion decreases"
With high grain – low fibre diets, chewing decreases, the production of saliva buffers is reduced and organic acid production exceeds the buffering capacity of the rumen. "Lactic acid is 10 times stronger than other rumen acids"
The accumulation of acid causes an influx of water from the tissues of the gut causing the common symptoms of acidosis, scouring and diarrhoea. Continued "metabolic insult" increases acid build up causing ulcers in the rumen which results in the infiltration of bacteria into the blood that cause liver abscesses. 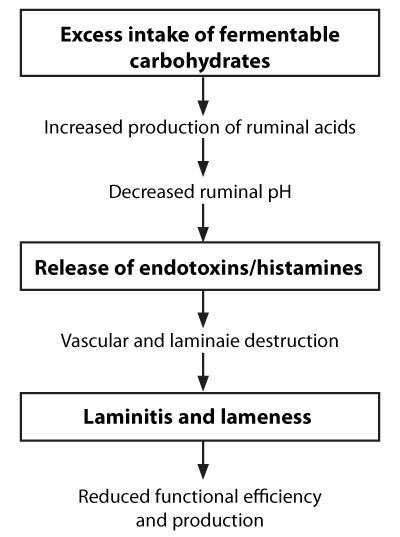 Acid damage to the ruminal epithelium allows the passage of endotoxins, histamines and probably other compounds which disrupt normal blood circulation and the process of cornification leading to inflammation of the laminal wall and foot disorders (Diagram 2). "Vascular destruction in the hoof results in laminitis"
Laminitis, caused by acidosis, is an important predisposing factor to feet disorders and severe lameness. Although some diseases (eg mastitis, metritis, foot rot) cause the production and endotoxins and histamines, nutritional mismanagement resulting in metabolic and digestive disorders is the primary cause of laminitis (Diagram 2). "Laminitis is the aseptic inflammation of the dermal layers inside the hoof"
Laminitis can be defined as acute and subacute depending on the severity and duration of the condition. 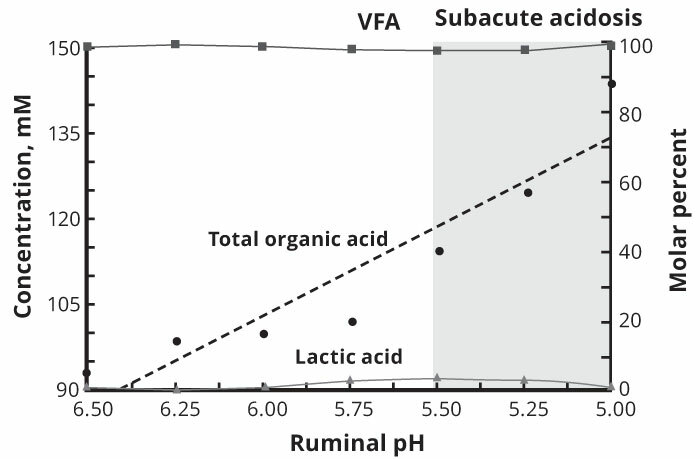 2 As the rumen pH falls, lactic acid bacteria (streptococcus bovis and lactobacilla) produce large quantities of lactic acid leading to reduced rumen motility and metabolic acidosis. Depending on the severity of acidosis, the endotoxins and histamines released increase vascular constriction and dilation which increases blood pressure causing seepage through vessel walls and mechanical damage. These processes ultimately cause corium damage and breakdown of the laminae. As the laminae layers are broken down, configuration of the pedal bone relative to the corium and dorsal wall changes causing compression of the soft tissue between the bone and sole. This results in haemorrhage, thrombosis and eventually a necrotic area in the solar region of the foot. Signs of acute laminitis include haemorrhages, discolouration of the hoof and softening of the horn texture. Claw lesions are associated with the production of inferior quality hoof horn thus changing the conformation of the foot (eg sole flattening and hoof overgrowth). With subacute laminitis, the process can be long and slow and the damage is not immediately observable. Nevertheless, because the horn is damaged this eventually leads to feet disorders. Other factors which aggravate lameness include unfavourable climatic environments and ground surfaces that cause mechanical damage. Excess body weight and poor leg and feet structures increase trauma stress levels and accentuate mechanical and vascular damage caused by laminitis. "Foot trimming and lameness can indicate feeding and/or structural problems"
Non structural carbohydrates (NSC) are highly fermentable and feed high in starch and sugars should not exceed 40 per cent of the diet if high quality long roughage is not available to stock. Consideration also needs to be given to the physical form of the feedstuff, the composition of the ration and the rate of feeding (Table 3). As with acidosis, the incidence of laminitis is reduced by good feed management. By trying to maximise growth rates, weight gains and body condition some producers walk a fine line between appearance and sick and lame stock. "Feed management has a significant impact on laminitis"
Sudden changes in the ration and "slug" feeding of highly fermentable carbohydrates are the primary cause of reduced fibre intake and digestion, decreased rumen buffering, increased levels of ruminal acids and decreased rumen pH. The level and type of fibre has a significant effect on saliva production and rumen pH. Fibre stimulates chewing which increases saliva production. Buffers in the saliva neutralise organic acids produced by the fermentation of carbohydrates (roughages and concentrates). "Grains have a faster rate of fermentation than roughages"
Highly processed "fast" grains are more difficult to feed than low processed "slow" grains (Table 4). Knowledge and evaluation of the rations ingredients and composition. Use feeding systems that allow the correct delivery and safe intake of concentrates. Avoid "slug" or "surge" feeding (ie 2 allocations of 2-3kg of concentrates). Select "slow" grains in preference to "fast" grains (eg oats v's wheat). Avoid highly processed grains (eg flaked maize). With "fast" grains incorporate an additional source of fibre in the ration (eg oaten chaff). Use a combination of grain sources. Blended "slow" grains with "fast" grains reduces feeding disorders. Use a "step-up" program when introducing stock to changes in the diet (ie 10% increments of grain over a period of 10 days). Adapt stock to high levels of concentrates starting with low levels (10-15 per cent) and gradually increase to 30-35 per cent of the diet using increments of 10 per cent. Use high quality long roughage to reduce the need for high intakes of fermentable carbohydrates. Ensure that the ration is properly processed and mixed. The inclusion of bulking agents (eg bran) are lower in starch and can replace 20 per cent of the grain component in the ration. (Note: high levels of bran and pollard can cause digestive disorders). Various additives (eg mineral buffers) can reduce the severity of acidosis and assist stock to adjust to grain diets. Avoid feeds that are contaminated and spoilt (eg mouldy). With changes in grain type, restart introductory-adaptation programs. Feed management affects rumen health which influences foot health and laminitis. Ration formulation requires a balance of feeds that optimise fermentation and saliva secretion to minimise the possibility of excess acid production. The ration ingredients should comprise of slower fermentable carbohydrates combined with suitable levels of high quality roughages to maximise fibre and dry matter intake. It is essential that stock are introduced to different diets and feedstuffs gradually and the number of changes and interruptions to feeding programs are minimised. Successful feeding of high grain – low roughage diets involves sound feed management and the use of feeding systems that prevent surges in the consumption of highly fermentable carbohydrates. Further ABBA Reading: Fast & Slow Grains – ABBA Jnl Sept 2007; Walking on Eggshells – ABBA Jnl June 2001; Supplements for Beef Cattle – ABBA Jnl Sept 2000; Selection – Structure and Lameness – ABBA Jnl March 2010. Note: A pH level below 5.0 in acute acidosis. With the build up of lactic acid and the progression of acidosis the overall level of organic acid increase due to higher levels of lactic acid. Increases in lactic acid dramatically reduces rumen pH and increases the severity of acidosis. Note: A pH of 5.0-5.5 is regarded as subacute acidosis. The reason for the drop in rumen pH is the accumulation of organic acids caused by over-production and decreased absorption. Subacute acidosis can develop into acute acidosis with continued feeding of fermentable carbohydrates (ie metabolic insult).